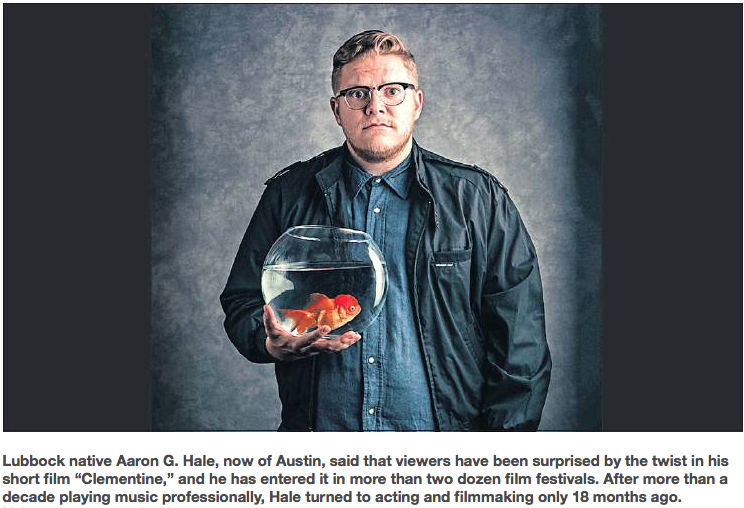 Last week, Aaron was Austin Film Project’s first Filmmaker of the Week of 2019! Check out the rest of the blog post about Aaron, and follow along to see more by clicking HERE! CLEMENTINE has been making its rounds in the festival circuit over the last few months and is winning lots of awards! ICYMI - I wrote and co-directed my first short film, CLEMENTINE, which is currently making the rounds of the festival circuit, and it looks like it is going to premiere on opening night at the Austin Revolution Film Festival in September. On top of being selected, CLEMENTINE has also received a half-dozen award nominations at the festival, including BEST TEXAS PRODUCED SCRIPT, TEXAS FILMMAKER OF THE YEAR, BEST TEXAS DIRECTOR, BEST TEXAS ACTOR, BEST TEXAS ACTRESS (Allison Day), and the MARGARET ANN GARZA ACTING AWARD (for best overall actor/actress)! You can buy tickets to opening night of the fest at Alamo Drafthouse for CLEMENTINE's first screening here. I was featured in a column in this past Sunday's (June 3rd) Lubbock Avalanche-Journal (my hometown's newspaper). Check out the column here and read more about my history, as well as my new short film, CLEMENTINE, which I've just submitted to dozens of film fests!